When looking for a family friendly gym with a pool, some concerns you may have include, “What activities does the gym have for kids?” or “Will my child have fun at the gym?” Here at California Family Fitness, we’re known as Sacramento’s best kids pool and spray garden to keep the kids cool and safe while having fun this summer. We understand your kids’ needs. Our Kids pool is perfectly sized for children, with a moderate and consistent depth throughout. You can enjoy playing with your kids, or lounging pool side with the peace of mind knowing the pool is safe. Our Swim Lessons are taught by a WSI (Water Safety Instructor) and ASI (Aquatics Swim Instructor) in the kids pool so your nervous swimmer will never feel like they’re in deep waters. We offer seven levels of swim lessons based on your childs’ ability and are taught in either a group or individual setting. We’ll always allow you to accompany your child in the pool if needed. Next to our kids pool area are the spray gardens. 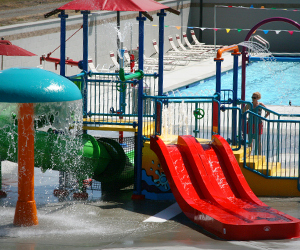 This aquatic playground lets your kids have fun climbing, crawling, and sliding through water spraying equipment. These structures are perfect for staying cool during the heat of the day while providing a safe place for kids of all ages to burn off energy. Has your family visited our kids pool & spray garden yet? If not, we’d love to have you (and your kids!) try out our facilities for 7 days free. If you are familiar with our kids water area, we look forward to seeing you & your little swimmers again soon!